The farm / garden, spanning over an area of 0.8 ha, accommodates 5 independent, air-conditioned apartments (traditional type), a swimming pool and a playground, while offering bicycles for free, so you can enjoy the nature of the surrounding areas. Evinos Garden is a unique countryside retreat for relaxed holidays suitable for you, for couples, and for the entire family. You will have time to rest and relax, along with time to do things together, and enjoy experiences full of adventure and fun, which will bring you closer and make you feel amazing. We offer our guests quality apartments and services, within a beautiful natural environment that allows numerous activities for adults and children during the entire year. In the summer months, our guests may swim in our swimming pool or opt for the sea, which is located 6.5 km away from our garden. The centre of the village is just 200 m. from the farm, where visitors shall find supermarkets and taverns to enjoy pure Greek countryside cuisine that uses materials and products of organic or sustainable culture. Quality restaurants, fish taverns and BBQs can be found in the surrounding villages and in the near cities of Nafpaktos and Messolonghi. Evinos Garden has 5 independent, air-conditioned apartments (traditional type), inside a private organic garden / olive grove spanning over an area of 0.8 hectares. To make your stay more pleasant, our garden is equipped with a swimming pool, a playground, and a parking lot, while bicycles are offered for free in order to enjoy riding in the nature. Extra linen change service(on request). Activities inside and outside the farm. 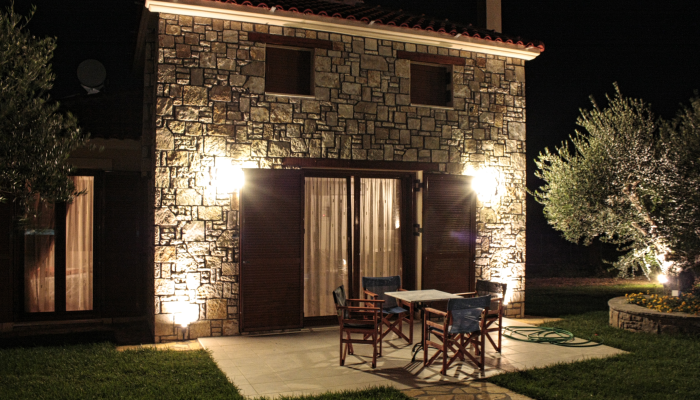 In Evinos Garden, our guest may relax and enjoy the unique natural environment, either through the spacious open areas of the living room next to the fire place, or in the veranda of the apartment, with a beautiful view to the lush hills and to the riverbed of Evinos. Moreover, guests may enjoy swimming or indulge in sun-bathing, while reading their favourite book, or enjoy the sunset while having a glass of Ouzo and a plate of traditional treats in the grand veranda of our garden bar. The garden is an area of heartfelt hospitality, but it is a live farm, with its choirs and operations. If you wish so – and we are certain that you will – you can taste farm life by participating, at your own pace, in our daily activities. The entire site is at your disposal. The same applies to your time, and you have numerous opportunities to make the most out of it. – Enjoy swimming and play games in the swimming pool, just a few steps outside the door of your apartment. – Beautiful nights with music, supplemented with the aromas of the local wines. However, one should not overlook the options for having fun outside the farm, in the surrounding area. You may choose to go hiking or ride the bicycle in the surrounding area. There are several courses, ranging between 3 to 20 km inside the forest, on the mountain, at the sea, and at the river. Moreover, during the summer, we may set up private or group courses to learn Greek. 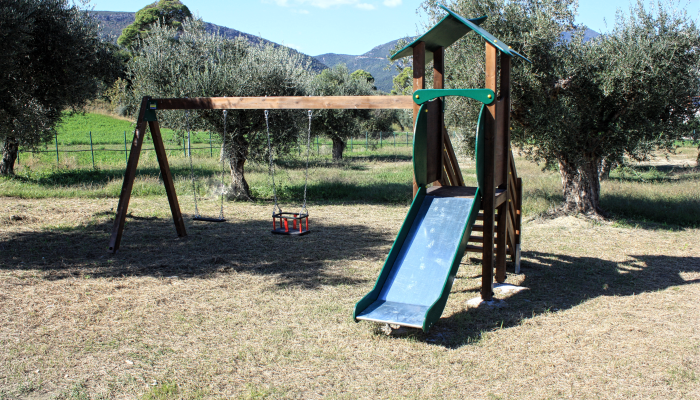 Thanks to its spacious area, Evinos Garden is a paradise for children. Children may wander freely inside the farm, enjoying a sense of freedom. In addition, they may play in the safe playground (swings, slides, etc.) or dip in and play in the swimming pool. We are proud for the fact that the protection of our environment is our core belief and underlines our daily practices in the farm. • Energy: Part of the electrical energy required for the daily operations in the farm is produced by a 10 kW solar farm. 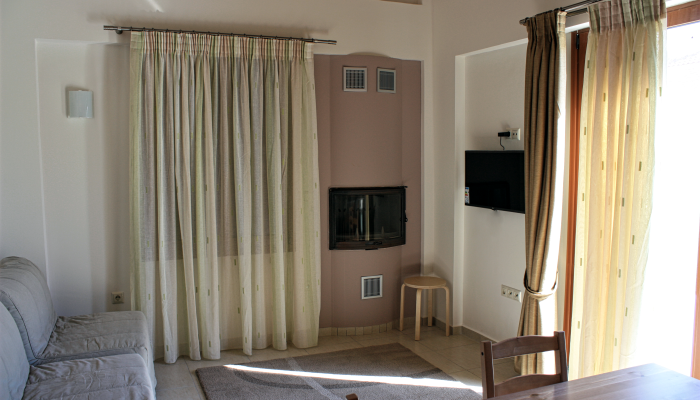 • Heating: All apartments are equipped with an energy-efficient fireplace in the living room for warm nights during the winter; if this does not suffice, the air-conditioning units can be used, operating with renewable energy. • Warm water: By making use of the extensive sunlight, we use solar water heaters to secure warm water in most days of the year. • Water for watering the garden and for the swimming pool: We use water from Evinos river in order to water the farm. • Lighting: We use LED or low energy lamps and a sensor to turn off the lights in our absence. • Wastes: These are separated and forwarded for recycling, while any organic residues are composted. • Local products: We try to secure almost all foods from local producers that employ sustainable practices. • with ISO 9001 for the quality of services offered.